After a turbulent summer, Chuks Aneke remains an MK Dons player and after his two goals on Tuesday night, is still a very important one. Whether his tactics to manufacturer a move away from Stadium MK have irked, annoyed or not bothered you in the least, few can question the impact he had on a side which has only lost to Premier League opposition so far under Paul Tisdale. Having not kicked a ball in anger since April, it took Aneke just six minutes to mark his return with a goal. He would finish with a second, which should have been a hat-trick, 70 minutes under his belt and a handshake from his new boss - all is forgiven. There have been plenty of positive words written and spoken about Dons this season, but what they have lacked at critical times is goals. Aneke was Dons' top-scorer last season, and was the most fruitful player in setting them up too, playing a part in 20 goals last term in a team relegated from League 1. His brace on Tuesday - a header and a well-placed strike from the edge of the box - showed exactly what Dons had been missing in his absence, while serving as a reminder just what the team has been lacking. It couldn't have been a better team for Aneke to have returned against on Tuesday night either. Peterborough are sick of the sight of the 25-year-old, from his thunderbolt in the 4-0 at London Road in January 2017 to his man-mountain performance in the 1-0 miracle at Stadium MK nearly 12 months later, Aneke appears to save his best for Posh. A sensational pass-and-move with David Kasumu saw him miss out on his hat-trick by less than 12 inches too. But while few have ever doubted his abilities with a football, his attitude has certainly come under question in the last few months. 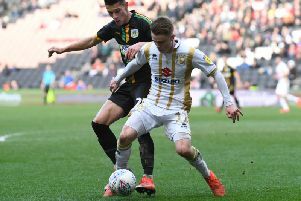 Barely training, wandering around Stadium MK alone, it was no secret he wanted away from Dons last month. Watching on as the team made an undefeated start to the season, many questioned whether his inclusion would be disruptive, whether it would upset the fine balance Tisdale has brought into the dressing room. "He was brilliant tonight and his attitude was spot on," said Ryan Watson, who set Aneke up for the first of the night. "He's a good player and he'll help us, he'll be a goal threat." "Football moves on very quickly," Tisdale added. "It is now a non-issue. The drama is over." The only drama he will want now is on the pitch.